There’s hundreds of billions of galaxies in the universe. You’ll sometimes find them floating out on their own, but more often than not, you’ll see them lined up in elongated strings that intertwine with other strings in cosmic knots and tangles, forming a vast web that stretches through an otherwise mostly empty universe. Galaxies are gregarious; you’ll find them traveling together in groups and clusters. When two such clusters cross paths, they can merge in a spectacular event that ranks among the most energetic in the universe—second only to the Big Bang. As such clusters typically approach each other at high velocities, cluster mergers are nature’s largest particle accelerators, generating relativistic particles whose births are betrayed by the showers of X-rays, gamma rays, and neutrinos they subsequently produce. Some of the highest energy particles can punch their way out of the merger in which they were formed and make their perilous ways out to our telescopes on Earth, where they are dubbed ultra high energy cosmic rays—among the most energetic of particles. Looming large among these grand mergers is El Gordo. Its moniker, Spanish for “the big one” or “the fat one,” is telling of the merger’s standing among other mergers—at 2 x 1015 M , it rivals the mass of the supercluster in which we reside (which has over a hundred groups and clusters) and is the most massive cluster observed at its distance. In addition, it is extremely luminous in X-rays and contains massive amounts of hot gas. Its mass, though a bit on the extreme end, is enough to raise one’s eyebrows at; its X-ray luminosity and vast quantities of hot gas, we can explain. But there’s one little oddity that begets a serious amount of head-scratching and hand-wringing—the velocities of its subclusters. For it exceeds the predictions of our standard model of the universe, concordance CDM, the result of a centuries-long journey on which we realized that our universe is made up predominantly of cold dark matter (CDM) and dark energy (denoted by the ), and one which wields considerable predictive power when it comes to a stunning array of observations. CDM predicts that the subclusters in massive mergers like the El Gordo should approach each other with a pre-merger velocity of no more than 1000 km s-1. Measurements of the relative radial velocity of the subclusters in El Gordo give a value of about 600 km s-1—which seem just fine… until you realize this doesn’t take into account the velocity component tangential to our line of sight, nor is it the subclusters’ pre-merger velocity. So that’s exactly what Molnar and Broadhurst set out to determine. Which is easier said than done. The distribution of the X-ray emitting gas and the locations of the peaks of the X-ray emission, galaxies, and total matter encode clues as to the true 3D relative velocity between the two subclusters at their observed redshift. Deriving the subclusters’ pre-merger velocities, however, requires backtracking in time. But as the brief introductory sketch of the energetics of cluster mergers may have indicated, the merger process is really quite a messy business. Isolated clusters pre-mergers can be relatively docile and unassuming, consisting of galaxies sweeping through a matrix of gas and dark matter, a mix balanced just so that they remain close to hydrostatic equilibrium (where the inwardly-directed gravitational forces are balanced by outward pressure forces). They remain in this stable state until the cluster succumbs to its gravitational appetite, subsuming its surrounding supply of gas, galaxies, and dark matter. When a cluster’s gravitational appetite is matched by that of an approaching, similarly massive cluster, things start to get interesting. The merger can produce shock waves in the intracluster gas, which can heat up the gas so much that it emits in the X-ray, in addition to producing complex wakes and tails such as those seen in El Gordo (see Figure 1). How the merger evolves is predominantly determined by the invisible dark matter halos that dominate the matter content of the clusters in which the gas and galaxies reside. The halos and their evolution can be significantly modified and deformed during the merger due to tidal stripping and dynamical friction. Thus it is no simple task to trace the El Gordo merger backwards in time. But it can be done. In today’s paper, the authors turned to numerical simulations outfitted with a suite of realistic physics algorithms to do the job. Their idea was simple: they threw several identical pairs of subclusters at each other—that is, identical except for a slightly tweaked infall velocity and impact parameter (the closest distance they’d pass each other in the absence gravity and other forces; for a head-on collision, this would be zero)—and followed the merger until it reached the observed state. They then determined which set of inputs produced a merger that best matched observations. Of course, the devil is in the details. The merger initial conditions were seeded with cluster masses and sizes from observations, and evolved forward in time using FLASH, a hybrid N-body and gas hydrodynamics solver. They presented results for simulations exploring infall velocities ranging from 2000 to 3000 km s-1 and impact parameters of 50-300 kpc. As the merger’s precise orientation is uncertain, each merger was rotated until it resembled observations. For a more precise comparison with observations, they calculated the X-ray emission expected from the gas, carefully taking into account relativisitic corrections that increase the amount of X-rays emitted by the shock-heated, accelerated gas during the merger, and the contributions from specific X-ray emission lines. In addition, they generated maps of the mass distribution and compared these with their observational analogs. The result? The simulation that best reproduced El Gordo’s comet-like “two-tail” X-ray morphology (see Figure 1), peak locations in both X-ray and mass maps, relative radial velocity, as well as the X-ray brightness profile was one in which its subclusters initially approached each other with an impact parameter of 300 kpc and an infall velocity of 2250 km s-1—more than double what CDM predicts. El Gordo is therefore another indication that CDM, despite its many successes elsewhere, is a theory that is almost but not quite fully baked. Stay tuned for more extensive numerical and observational studies on this portly merger and its implications to cosmology to come. Figure 1: Comparisons of this paper’s simulations with observations of the El Gordo cluster. In the left image is El Gordo’s observed X-ray surface brightness (measured by the Chandra X-ray Observatory, Menanteau et al. 2012). 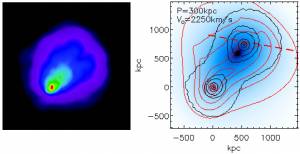 The image on the right is of this paper’s best matching simulation; the X-ray surface brightness is plotted as red contours, the SZ amplitude in blue, and the total mass surface density in black contours. I am a fourth-year graduate student in The Ohio State University's Department of Astronomy. On a day-to-day basis, you can typically find me attempting to smash clusters of galaxies together inside big supercomputers with Dr. Annika Peter to see if cluster mergers are good testbeds for dark matter collisionality. As an undergraduate at Caltech, I spent a few years chasing photons where planets are thought to form (or, as they say, performing Monte Carlo radiative transfer calculations of protoplanetary disks) with Dr. Neal Turner of the Jet Propulsion Laboratory. When I'm not sitting in front of a computer trying to translate cosmic thoughts into pithy lines of code, you can find me in the kitchen or on the walls of a climbing gym. In my recent paper (http://adsabs.harvard.edu/abs/2014arXiv1410.7438T) I showed that LCDM actually plays very nicely with these large clusters with high pairwise velocities. The devil is in the details of how we define a ‘halo’ within our simulations. Simply considering the spatial distribution of particles is not enough; if we additionally use the kinematic information we can much more easily identify merging structures as independent groups, which in turn reveals much higher pairwise velocities for these massive clusters. Thanks for this post! As I was reading, I wondered if limitations in the simulation might explain some of these strange results. It is interesting to see the comment by Robert above, as he suggests that this might be the case!